neufer wrote: Past the point of no return"
After reaching the point of no return you might as well ---Go - All - The - Way! Well; it is football season. <<The point of no return is the point beyond which someone, or some group of people, must continue on their current course of action, either because turning back is physically impossible, or because to do so would be prohibitively expensive or dangerous. It is also used when the distance or effort required to get back would be greater than the remainder of the journey or task as yet undertaken. A particular irreversible action (e.g., setting off an explosion or signing a contract) can be a point of no return, but the point of no return can also be a calculated point during a continuous action (such as in aviation). The term PNR—"point of no return," more often referred to by pilots as the "Radius of Action formula"—originated, according to the Oxford English Dictionary, as a technical term in air navigation to refer to the point on a flight at which, due to fuel consumption, a plane is no longer capable of returning to its airfield of original takeoff. After passing the point of no return, the plane has no option but to continue to some other destination. In this sense, the phrase implies an irrevocable commitment. For nonstop flights between two definite locations, the PNR is actually beyond the halfway (more exactly, the "equitime") point, since aircraft usually carry more fuel than is necessary to reach the destination. For example, on a 2000-mile flight, should the tanks have enough fuel for a 3000-mile flight, the halfway point would be at 1000 miles, but the PNR would be at more than 1500 miles. Neither does the PNR correspond to the halfway point of fuel usage. With loss of mass due to fuel consumption, it takes less fuel for an aircraft to cover a given mileage. An aircraft might expend, say, 60% of its total fuel load before reaching the PNR. The PNR can be further extended in this manner by dropping unnecessary fuel tanks or ordnance. Another aviation use is the point during the takeoff roll when there is no longer enough runway ahead of the airplane to stop safely; at this point, the aircraft is committed to taking off. In mountain aviation, the phrase is sometimes used in a completely different way to refer to the point at which the grade of the terrain "outclimbs" the aircraft—that is, the point at which a crash is inevitable, being a parallel in common usage. The phrase can also be used in this sense to denote inevitable disaster. The first major metaphorical use of the term in popular culture was John P. Marquand's novel "Point of No Return" (partially serialized in 1947, published in book form in 1949). It inspired a 1951 Broadway play of the same name by Paul Osborn. The novel and play concerned a pivotal moment in the life of an American banker, but they also explicitly referenced how the original expression was used in World War II aviation. Since then, "point of no return" has become an everyday expression, with its aviation origins probably unknown to most speakers. It has served as a title for numerous literary and entertainment works. * Crossing the Rubicon is a metaphor for deliberately proceeding past a point of no return. The phrase originates with Julius Caesar's invasion of Ancient Rome when, on January 10, 49 BC, he led his army across the Rubicon River in violation of law, thus making conflict inevitable. Therefore the term "the Rubicon" is used as a synonym to the "point of no return". * Alea iacta est ("The dice is cast"), which is reportedly what Caesar said during the aforementioned crossing of the Rubicon. Elizabeth boldly declared "Iacta est alea" and approached the window. o Burn one's bridges. The expression is derived from the idea of burning down a bridge after crossing it during a military campaign, leaving no option but to win, and motivating those who otherwise might want to retreat. This expression can also be used figuratively, as in, "On my last day at my old job, I told my boss what I really think about the company. I guess I burned my bridges." o Burn one's boats, a variation of burning one's bridges. The Muslim commander Tariq ibn Ziyad, upon setting foot on the Iberian Peninsula in 711, ordered his ships to be burnt, so that his men had no choice but to thrust forward and conquer the peninsula. The same strategy was used by Hernan Cortes, who burned and sank his boats, so no other option was left than to advance into Aztec territory. o "Break the woks and sink the boats (破釜沉舟)", an ancient Chinese saying referring to Xiang Yu's order at the Battle of Julu; by fording a river and destroying all means of re-crossing it, he committed his army to a struggle to the end with the Qin and eventually achieved victory. bystander wrote: Reaching the Mid-Mission Milestone on the Way to Pluto! And still a long way to go! It is nearing the orbit of Uranus though. A NASA Pluto probe may be slumbering at the moment, but it's still tearing through space at a blistering pace, closing in on the orbit of Uranus. The New Horizons probe is the fastest spacecraft ever launched from Earth, having sped from its home planet in 2006 at about 36,000 mph (nearly 58,000 kph). It had covered half the distance of its nearly 3 billion-mile (4.8 billion-kilometers) voyage by last February, and the spacecraft should reach Pluto in July 2015. Currently, New Horizons is about 18.5 times farther from the sun than the Earth is, and it should pass the orbit of Uranus in March 2011, NASA officials said. The spacecraft is flying to study Pluto and its three known moons — Nix, Hydra and Charon. In recent years, a number of revelations have come out regarding Pluto from the Hubble Space Telescope, such as the discovery of Nix and Hydra, as well as apparent geyser eruptions and seasonal color changes on the dwarf planet. "These discoveries have helped develop our encounter with Pluto, which is now fully planned," said New Horizons principal investigator Alan Stern of the Southwest Research Institute in Boulder, Colo. "We have a list of things of do, which has been converted into a timeline of events, which has been converted into spacecraft software with all the commands to run the spacecraft and instruments." New Horizons "is very different from most missions in the solar system today," Stern told SPACE.com. "It's like we're back at the early days of planetary exploration." Dozens of missions have been sent to Mars and the moon, and multiple spacecraft have checked out Venus, Jupiter, Mercury and Saturn, as well as various comets and asteroids. But faraway Pluto has escaped such attention thus far, Stern said, as has its neighborhood, the Kuiper Belt — the ring of icy bodies beyond Neptune's orbit. "With New Horizons, this is our first reconnaissance of Pluto, of this kind of world — we've never sent a mission to the dwarf planets before, never sent a mission to the Kuiper Belt," Stern said. "This is the first time we're going to see a new type of planet since the '70s, when we had our first mission to a giant planet, Jupiter." Pluto and the Kuiper Belt remain mysterious in many ways, and New Horizons should help fill in some major gaps, Stern said. "So we don't have a narrow scope here — we're going to write the book on Pluto and the dwarf planets," he said. "We're here to map Pluto, map its surface composition, measure its atmospheric composition, pressure and temperature and assay the same kinds of measurements for all of its satellites." — we've never sent a mission to the dwarf planets before...."
New Horizons wasn't sent to a dwarf planet(; it was sent to a planet). tis true, Pluto hadn't been diminished prior to the launch. New Horizons to cross Uranus' orbit! New Horizons passes the orbit of Uranus on March 18, 2011. 2000 days since launched; NH keeps chugging along. Today New Horizons is 4 years away from Pluto! On the anniversary of the first landing of men on our moon, New Horizons mission team scientists have announced the discovery of a fourth moon around Pluto – adding to the scientific treasure trove that awaits NASA’s Pluto-bound New Horizons when it arrives in 2015. A Hubble Space Telescope observing team led by Mark Showalter of the SETI Institute, Mountain View, Calif., and Douglas Hamilton of the University of Maryland, College Park, detected the new moon in five sets of Hubble Space Telescope images taken over the past two months. Astronomers are still trying to better peg orbital details on the object, designated “S/2011 P1” or “P4” until it receives a permanent name. They’ve put its diameter at between 8 and 21 miles (13 to 34 kilometers) and estimate that it travels on a circular, equatorial orbit nearly 37,000 miles (about 59,000 kilometers) from Pluto – placing the new moon between the orbits of the moons Nix and Hydra. Astronomers using the Hubble Space Telescope discovered a fourth moon orbiting the icy dwarf planet Pluto. The tiny, new satellite — temporarily designated P4 — was uncovered in a Hubble survey searching for rings around the dwarf planet. "This is a fantastic discovery," said New Horizons' principal investigator Alan Stern of the Southwest Research Institute in Boulder, Colo. "Now that we know there's another moon in the Pluto system, we can plan close-up observations of it during our flyby." The dwarf planet's entire moon system is believed to have formed by a collision between Pluto and another planet-sized body early in the history of the solar system. The smashup flung material that coalesced into the family of satellites observed around Pluto. If "P4" can't be named after Clyde Tombaugh, which would be nice, then I suggest the name of "Nut" (the Egyptian version of the Greek goddess of darkness and night: "Nix"). Then we can all say that there some loose "Nut" flying around out there. Ann, in the BIG images, P4 looks like it's blue. How bout we call it "Ann"?? Or do you not really like dogs? 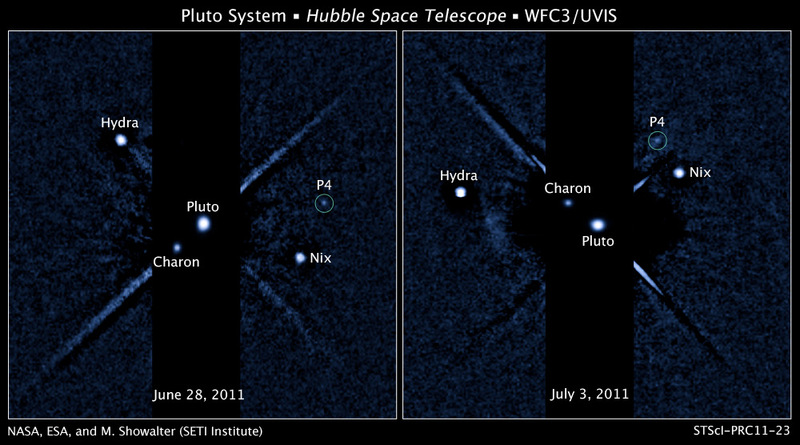 The new Moon, P4, orbits between Pluto's previously discovered small moons Nix and Hydra. July 20, 2011: These two images, taken about a week apart by NASA's Hubble Space Telescope, show four moons orbiting the distant, icy dwarf planet Pluto. The green circle in both snapshots marks the newly discovered moon, temporarily dubbed P4, found by Hubble in June. P4 is the smallest moon yet found around Pluto, with an estimated diameter of 8 to 21 miles (13 to 34 km). By comparison, Pluto's largest moon Charon is 746 miles (1,200 km) across. Nix and Hydra are 20 to 70 miles (32 to 113 km) wide. The new moon lies between the orbits of Nix and Hydra, two satellites discovered by Hubble in 2005. P4 completes an orbit around Pluto roughly every 31 days. The new moon was first seen in a photo taken with Hubble's Wide Field Camera 3 on June 28, 2011. The sighting was confirmed in follow-up Hubble observations taken July 3 and July 18. P4, Nix, and Hydra are so small and so faint that scientists combined short and long exposures to create this image of Pluto and its entire moon system. The speckled background is camera "noise" produced during the long exposures. The linear features are imaging artifacts. The Hubble observations will help NASA's New Horizons mission, scheduled to fly through the Pluto system in 2015. Space Telescope Science Institute director's discretionary time was allocated to make the Hubble observations. Beyond wrote: Ann, in the BIG images, P4 looks like it's blue. How bout we call it "Ann"?? Or do you not really like dogs? Mmm, I prefer cats. How about if we name P4 "Bastet"? You know, after the Egyptian cat god? Then I wouldn't mind seeing Bastet also being named Ann! Doesn't "Bastet Ann" sound pretty good? neufer wrote: If "P4" can't be named after Clyde Tombaugh, which would be nice, then I suggest the name of "Nut" (the Egyptian version of the Greek goddess of darkness and night: "Nix"). Then we can all say that there some loose "Nut" flying around out there. I'm with art, let's name it Clyde, or Nox, goddess of the night/darkness, a Roman variant of Nyx. Ann wrote: Mmm, I prefer cats. How about if we name P4 "Bastet"? You know, after the Egyptian cat god? I'm not familiar with Egyptian gods, but "Bastet Ann" just doesn't seem to have a 'ring' to it. I don't know if we should be mixing cats and dogs and people together. It could get kinda messy. How bout we call P4 -Plutina-?? Anyway lets get rid of that P4 designation! It sounds like something you do for your doctor during a physical!